I was invited as media to try comped menu items. All thoughts are my own. 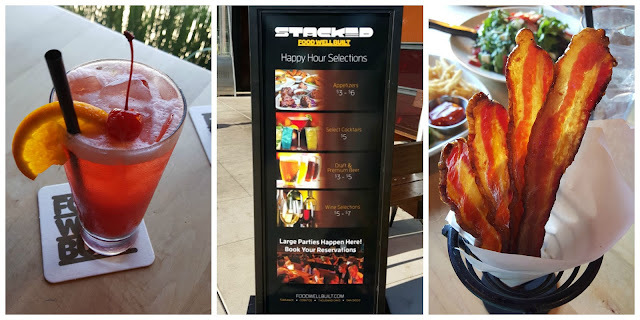 Last week, Erin of Horsing Around in LA and I joined up to try out the new Basil inspired menu items at Stacked. I had only been there one time before for a sports party and I was excited to see what other delights they offered. My children were intrigued by the iPad ordering computer at the table but were quickly engrossed by the kids menu craft. Have you ever seen Wiki Stix? They are wax covered strings that can be used to create anything that their imagination comes up with. 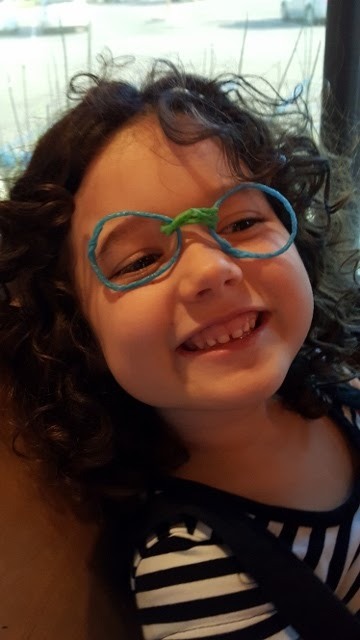 My daughter made glasses. While the kids were creating, we took a look and ordered some of the starters. Which should we get? Drinks, appetizers, or Spirits? How about a little of all? Since I was driving, I decided to share a strawberry lemonade with my daughter and a August Special Basil-Strawberry shake with my son. I was pretty delighted with my drinks until the appetizer came. O.M.G.! Did I mention it was CANDIED BACON? Maple syrup covered bacon goodness! It melted in out mouths. Even the kids couldn't get enough! As we were enjoying our treats and shared on Instagram and Twitter, we noticed a fun screen on the wall that highlighted and showed all of the pictures that we shared. Anyone that goes to Stacked Instagram or Twitter and tags them can see them on their live feed. The kids got a kick out of seeing themselves larger than life. It was time for our dinners to arrive. I chose a light Basil, Strawberry and Feta salad. It was light and cool on that hot day. It came with a Cranberry Balsamic dressing and could be eaten as a meal or share it with a friend and share a pizza. Erin had ordered the Caprese Turkey Burger. According to her, " Oh.My.Yum.!" This burger was full of flavor with fresh ground turkey patty, parmesean crumbs, carmelized onions, Applewood bacon, Roma Tomatoes, Avocado, Fresh Basil and Creamy Burrata, all on a Brioche Bun with Roasted Pepper Aioli. A burger "Well Built" that lives up to the motto of the restaurant for sure. I can't wait to see what combination they come up with for September, rumor is, it might be more BACON! With burgers, there must be sides. We chose the Mac N Cheese. This isn't your kids Mac N Cheese though! I feel like I am becoming a Mac "N" Cheese snob and this one passed with flying colors. 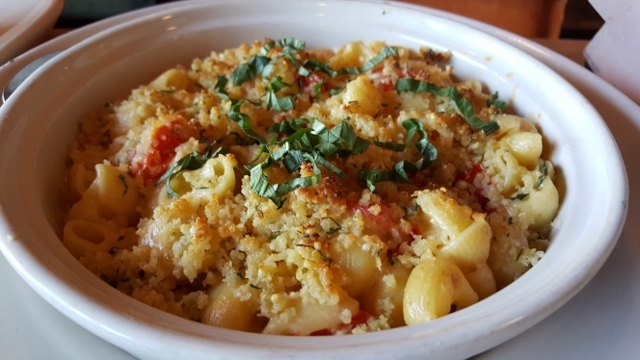 You will find that the Tomato, Basil and Mozzarella Mac "N" Cheese delights your tastebuds with fresh Basil, Macaroni Noodles, Three Cheese Blend topped with Mozzarella Cheese and Parmesan Breadcrumbs. Definitely a favorite at our table. Not in the mood for Burgers and Mac "N" Cheese? Try the Pizza! 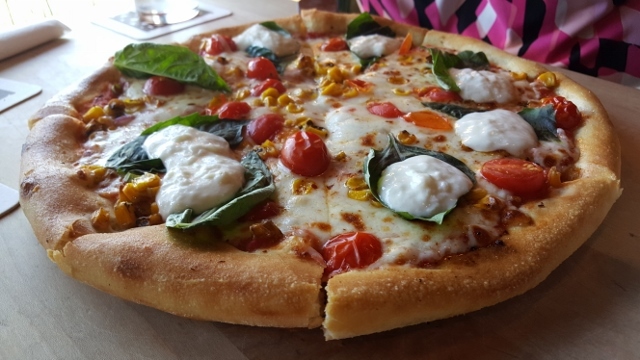 We had the Tomato, Basil, Grilled Corn Pizza with Burrata. Stacked with plenty of Mozzarella, Grape Tomatoes, Red Pepper Flakes, Cheese and Sweet Corn, it was unlike any pizza I had ever had. While my kids snacked on the starters with us, we did actually order off the kids menu. The portions were HUGE! The leftovers actually became lunch the next day. My daughter ordered the chicken and I loved how it had healthy options for sides. My son couldn't resist the pizza that was the size of most chains Medium or Large. His eyes got HUGE! It seems to any logical person that we had to have eaten enough right? Well, NO! There was the one thing that we just couldn't pass up, dessert. LOL. In all fairness, we did split it between the four of us. Even though we went to try out the Basil Menu, there was no Basil in the Peanut Butter Heaven. 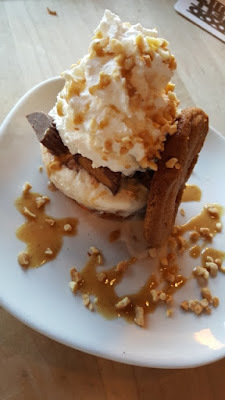 It DID have, Cookies, Peanut Butter Cups, Ice-Cream, Whipped Cream and Nuts. I am sure it was all fat free right? 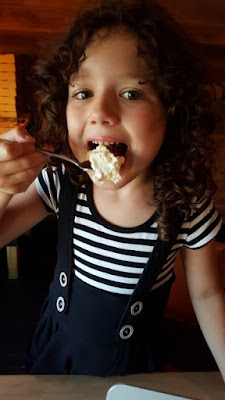 Okay, maybe not but it was worth every bite, just ask my daughter! I can't wait to taste-test the future menu items as well! If these are any indication, I won't be disappointed. 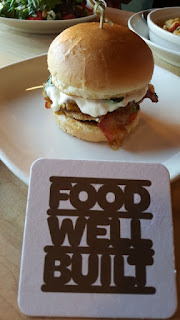 DISCLAIMER: I was invited as a media guest to give my honest opinion on Stacked menu items. All thoughts are my own. Do not use any photos without permission. This looks like a really cool place! Thanks!!! I have not been to this place before but everything does look quite delicious.